After a bromide print is bleached, some practitioners soak it in an acid bath to remove the color, resulting from residual chromium, which is variously described as a light grey, green, or blue. Welborne Piper did not use an acid bath--he resorted to Farmer’s Reducer to “fix” his image, though his editor stated it was to remove the “under image.” C. H. Hewitt, writing in 1908 stated “...for ease in pigmenting it is necessary that the untanned portions be swelled by the absorption of water. A bath of weak sulphuric acid hastens this swelling.” The acid bath may have been necessary to soften the gelatine after bleaching in the early ferricyanide bleaches. 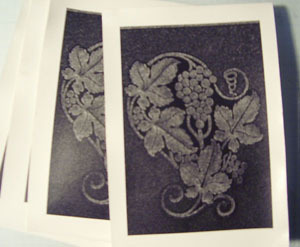 Later it seems to have been used primarily to remove color from the bleached image, though some practitioners still maintain that it can improve inking qualities. David Lewis, in his book, The Art of Bromoil and Transfer, says that 2 or 3 minutes in a 1 to 2% solution of sulphuric acid “facilitates inking” of the matrix, but that he has found the acid can damage the paper when used before fixing, so he now uses it after fixing. I have tried using an acid bath, both before and after fixing, but found it made the print more difficult to ink. I even tried using a much milder solution, but still had problems with uneven inking and the ink not taking well overall. I. 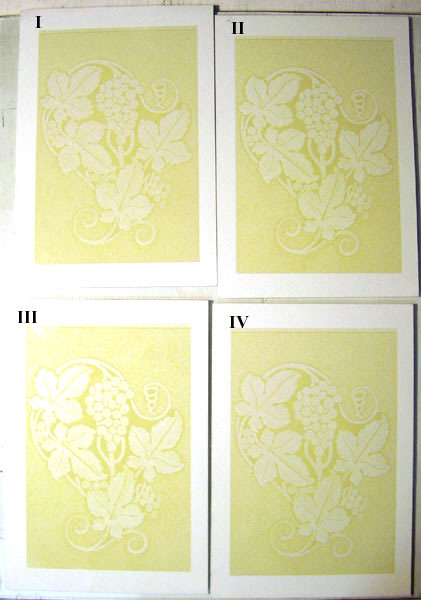 The first print would be fixed in a 10% hypo solution and receive no other processing than a wash.
II. The second print would be fixed in a 10% hypo solution and given a 3 minute bath in distilled water with 2 drops of strong sulphuric acid per ounce of water. III. The third print would be fixed for 5 minutes in a 20% hypo solution with 12 grams per liter of sodium bisulfite added (I didn’t have potassium metabisulfite). IV. The fourth print would be fixed in a 10% hypo solution, followed by 3 minutes in a 5% solution of EDTA disodium. I measured the pH of the two fix solutions as well as the two after-bath solutions. Then, after bleaching, I measured the reflection density of the paper base, a high value portion of the matrix, and a shadow area. 10% hypo + 3m in sulphuric acid sol. Click on the picture above to step through the results of my experiment. or click on the last image to see my conclusions.